Nobody knows Huntington Beach better than locals who live and breathe it every day. Take a look at their insider tips and why they are proud to call Surf City USA home. Well, coming from Chicago, I’m a huge Bears, Cubs and Blackhawks fan. It’s pretty easy to find a great beer and a fun crowd in Huntington Beach when games are on. Gallaghers is a Bears bar and they even serve Chicago style pizza. Slater’s 50/50 is always popular on game day along with Longboard's and Fred’s since they have a lot of TVs and drink and food deals, especially during football season. 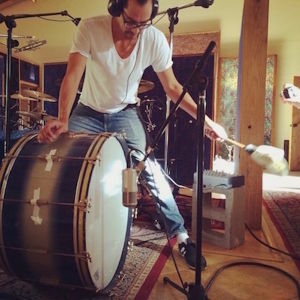 As lead percussionist for popular reggae band, the Dirty Heads, Jon Olazabal finds inspiration in his hometown, Huntington Beach. Music has been a large part of the artistic culture in Surf City USA as many popular bands and artists have had their start in this beach side community. Jon's unique sound is unmistakable and the band has had great success touring the world and selling out venues with hits such as "Lay Me Down" and "My Sweet Summer" and "Stand Tall". Known as "Jon Jon" to his fans, Olazabal shares his favorite parts of Huntington Beach and how he got his musical start. Have you always wanted to be a drummer? When I was young I always wanted to play a big drum set but I lived in an apartment and I couldn’t make that much noise. So my dad ended up getting me a bongo set and then my sister took me to this drum circle in Huntington Central Park and that’s when I first started playing with a big group of people. I guess that’s where I first learned how to play. I pretty much figured everything out from there. That’s what started it all. Who were some of your favorite artists that influenced your music career at an early age? I listened to and would try to play along with the early Santana records on my drums. I’d listen to a lot of the Grateful Dead - that was the hippie stage when I was much younger. My sister got me into a lot of the classic stuff but that’s where I learned a lot of the sound and a little of the technique. Of course I had no idea what I was doing in the beginning but throughout the years I guess I’ve kind of polished it. I felt good with it from the beginning. How did The Dirty Heads get their start in Huntington Beach? I’ve been playing percussion for maybe 15 years or so… maybe longer it seems now, but I’ve lived in Huntington Beach pretty much my whole life. I met Jared, one of the singers, when we were kids. We were neighbors and started skateboarding together. Eventually we were on the surf team together at Marina High School and it kind of went from there, playing music and hanging out. We started playing music together as the Dirty Heads our junior year of high school in 1998 or so, and started playing shows right after that. We put our first record out in 2008. The record was called Any Port in a Storm and that was when things started picking up for us and we started touring the states and eventually the world. How does Huntington Beach inspire your music career? Growing up in Huntington Beach, we spent a lot of time at the beach as kids and we still do to this day. The beach always inspired the reggae feel of our music and we’ve always been moved by that vibe. I guess that’s what got us in the beginning, being big fans of Sublime and the Beastie Boys. There have been so many great bands that have come out of Huntington Beach and the Orange County area. That really pushed us a lot in the beginning, giving us the inspiration and motivation and seeing that if they could do it, we could do it. That kept us going. Its funny cause a lot of awesome local bands are completely different and very far away from what we do and our style of music. There are bands like No Doubt or us and then you have bands like Avenged Sevenfold that came out of Huntington Beach. 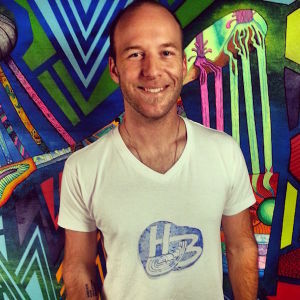 It’s great to see the broad scope of people creating music and art in Huntington Beach. What are you most passionate about and what sparks your creativity? My biggest passion is music, most definitely. That takes up the majority of my time and the majority of my brain. But when I’m not doing that I definitely spend a lot of time down at the beach surfing. It’s great to be home during the week when we’re not on tour and when it’s a lot quieter down at the beach. I’m able to cruise around and have my own space and that’s where a lot of inspiration can come from, having a nice quiet beach all to yourself. It’s pretty nice. I’m lucky in that way. Tell us how you spend your time in Huntington Beach when you’re not on tour. Fall in Huntington Beach is the best time of year, or at least it’s my favorite. The surf is always the best and school is back in session so it’s great for us to be able to hang out at the beach and cruise around the boardwalk. That’s what I do almost every morning with my coffee, skate down the boardwalk, try and find some surf. It’s great down by the water and cruising up and down Pacific Coast Highway. I have a 1975 dark green Ford Bronco and it’s the perfect car to drive along the coast, have the top off and be able to check out the surf. It’s a great car and it’s perfect for here in Huntington Beach where the weather is always great. What’s your favorite place to hang out in Huntington Beach? To be honest, a lot of my free time is spent at the beach; it’s the best spot. As far as the rest of Huntington Beach, there are a lot of new great restaurants around here. My favorite is Sancho’s Tacos down on PCH. I’ll get a breakfast burrito and watch the surf and hang out. There are a lot of good spots and Huntington Beach is definitely coming up. I’m excited to see Pacific City and what’s going on over there with the restaurants, shops and bars. Why do you live in Surf City USA? We’re lucky to tour pretty much the whole world and we’re very fortunate to see a lot of really cool and beautiful places. But coming home, there’s nothing like Huntington Beach and I swear all of us say the same thing, maybe we’re biased, but Huntington Beach is by far the best. We have a mix of the ocean right here and the mountains nearby if you want to go snowboarding. We just have a little bit of everything and it’s by far the best. I wouldn’t want to live anywhere else. Have questions about Musical Influence in Huntington Beach? Ask Jon! You can find him on Instagram at @jonjondh! 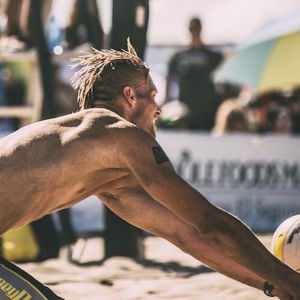 I always dreamt of being a professional beach volleyball player and in 2001 when I was still in college, I walked down Main Street and there was Jack's and all the surf shops and people crossing Pacific Coast Highway to the beach. It was really cool seeing the drum circle by the Pier and the performers. Seeing all the volleyball courts, the rows and rows of volleyball courts, it was just a very magical experience for me. I felt like this is the place where you should live if you want to do anything in your life. No matter what you want to be, this is where you have to live because you have the opportunity to do anything you want. Especially being a beach volleyball player, I wanted to be in Huntington Beach for the rest of my life after that moment. That was it for me. I love that AVP hosts a tour stop in Huntington Beach during the summer, this year it's May 5-8. It’s always the most exciting because I get to be home. Playing on my home beach on the sand that I love and around my community. No matter what time of the year, there’s something going on that your family can enjoy and you don’t get that anywhere else. I’ve gone to other beach cities and they’re like ghost towns. If you love being outside at the beach, this is the place to be. Jamie Heraver grew up in Chicago and fell in love with surfing the moment she stood up on her first wave. Today, you can find her surfing and catching the swell around iconic Huntington Beach surf spots. Surf City USA rests seaside bordering the Pacific Ocean and is known for its 10 miles of uninterrupted coastline. With two main breaks offering several miles of peaky fast waves year-round and a rich surfing history and culture dating back over 100 years, there's no doubt that Huntington Beach is a surfer's paradise! How did you get introduced to surfing? I got into surfing during a vacation to Maui when I was 13. It was one of my first trips to the ocean and I thought it would be so cool to get a surf lesson. I took my first lesson from Buzzy Kerbox there in Maui and stood up on the first wave. I’ll never forget that feeling. I instantly felt like I was meant to surf and ever since that moment I’ve done whatever I could to get to the ocean. And I found myself here in Huntington. Did surfing bring you to Huntington Beach? I’ve lived in Huntington Beach for a little over 3 years now. I think what drew me to the city was the vibe. It really felt like an instant family within the surf community. I always wanted to surf. It’s been a huge passion of mine for as long as I can remember. Growing up in Illinois it was impossible to surf and I had gone on a handful of trips to Huntington Beach. I just knew right away that I was meant to be here and this felt like home to me. How did you manage learning to surf in Surf City USA, a very popular and competitive surf destination in the US? One of the first people who felt like family to me after I moved to Huntington Beach was Rockin Fig over on Main Street. He instantly took me in and was super supportive of me following my passion. He’s probably a big reason why I ended up settling here. The guys at the Pier also gave me tips and taught me almost everything I know about surfing. They made sure I was safe paddling out on bigger days. Do you have any tips or suggestions for groms or new surfers? The best thing to do if you’re a new surfer is to get a lesson from one of the local spots like Zacks or the Huntington Beach Surf School. All the guys who teach there are super skilled and have really good tips to get you on your feet in your first lesson. Also, it includes everything you need like your wetsuit (the water can be really chilly depending on the time of year) and gear, and they can take you to a spot that is safest for you and everyone else in the water. The ocean should be respected for its power and so should the other surfers on the water. It’s money well spent to learn to surf safely, and best of all you’ll learn things that will progress your surfing 10 times faster than learning yourself! What’s your daily surfing routine? For me the coolest thing about living here is I can start my day on the water. Grab my coffee and walk to the waves and see what’s going on. I don’t really feel normal or balanced unless I start my day on the water. There’s nothing like feeling the sand on your toes and getting salty to start the day. Describe the passion involved with surfing. How are you able to wake up every morning and dive into the cold ocean water? My passion for surfing is about being on the water, there’s no other feeling like that. It’s basically out of this world. You know for me, the reason I gave up everything to come out here was so that I could feel that sensation every day. There’s nothing like the rush of dropping in on a wave and I think that’s what inspires me the most. Basically just training and challenging myself to be the best surfer I can possibly be. Whether it’s going to new spots, paddling out on bigger waves, or all around surfing with more control. So I guess what keeps me going every day is my passion to be the best surfer I can possibly be for the rest of my life. Why do you and many other surfers live in Huntington Beach? It’s hard for me to think of a better place to live than here in Huntington Beach because of the family that I have within the local surf community. I can connect with a lot of the people here. We just kind of understand each other. You can look at another surfer and just know. We have that feeling on the water, that feeling of just getting lost out there and just becoming one with nature and being so separate from the world for that moment in time. It doesn’t get much better than that. Huntington Beach offers that. What makes the city such a great Californian surf town? One of the best things about being a surfer in Huntington Beach is that you can surf year round. It’s Surf City USA. I think that’s what I love the most about living here, that you can paddle out any day of the year. I’m pretty sure I’ve seen a surfer out there every single day since I’ve moved here which is pretty rad. You can technically wear a bikini every day if you want to. The weather and waves are always amazing. How has living in Huntington Beach inspired you to become a better surfer? Paddling out here at the Pier, just being around some of the best surfers in the world and local legends, that makes me want to be a better surfer. They have so much knowledge to pass down. Surfing is multifaceted in the sense that there are so many aspects to the life of a surfer. You can surf just for the pure feeling or enjoyment or you can surf in a competition to get that adrenaline rush and see how you measure up to everyone else. But to me, there is nothing like the adrenaline rush of paddling out on a bigger day. And that’s what I like to train for, pushing myself to get better and surf bigger. Huntington Beach is inspiring and makes that possible. I wouldn’t want to be anywhere else. Have questions about Surfing in Huntington Beach? Sam Bernal grew up in Southern California and studied Physics at Eastern Washington University before going into lighting engineering. Nearly five years ago, Sam was injured in a rock climbing accident. With a decreasing enthusiasm for engineering and an increase in spare time, Bernal began to pursue his passion for art in Huntington Beach. He has made over 60 paintings since his recovery and stand by his motto, “DREAM. FAIL. SUCCEED. REPEAT.” It is even tattooed on the inside of his right arm. His work can be viewed at his website, www.sambernal.com, and at his booth each weekend in Pier Plaza. You have such a unique style, tell us about your artwork. As an artist, I create to share. Every painting I made I consider a practice painting. I can always make another one if it I mess it up. I really started to develop my style once I let go of expectations and just allowed myself to have fun with what I was doing. There was no pressure, it was just for fun anyway. I use paint pens, acrylics, and spray paint to make psychedelic, trippy surf art. It has a lot of bright neon colors with fine black outlines in a graphic style. Each piece contains a lot of detail and geometry. What brought you to Huntington Beach? My grandmother has lived here in Huntington Beach for over 60 years so a lot of my family grew up here. I was born in Riverside, but my mom worked at a runaway teen shelter in Laguna Beach. I’d spend 2 days a week with my grandma here in Huntington Beach, and while she was watching me my uncles would teach me to surf. I’ve spent loads of time here at the Pier when I was a kid. I always just loved the smell of the ocean air and could never wait to come back here. What about Huntington Beach inspires your artwork? Whether it’s surfing at the beach, skating down the boardwalk, or hanging out at Surf City Nights, Huntington Beach always keeps me inspired. I use a lot of sunset imagery in all my paintings and Huntington Beach has some of the best, world-class sunsets. Nature’s putting on its own psychedelic show almost every night here in HB. And that is a huge inspiration for me in a lot of my paintings. Where do you go to paint? Do you have any secret spots? I do a lot of my painting at my house, but when I venture out, most of my work is taking place in my art booth. So when I have my booth set up in Pier Plaza on Fridays, I do a lot of painting there where people get to see it. People will watch my work as it comes along or visit me throughout the week and see the new paintings that I have started. If I’m looking for a quiet place, I love to go to Central Park and hang out by the lake. There are some really amazing gardens there. Or my favorite beach spots are the cliffs or at Warner Ave as you enter Sunset Beach. It’s always pretty chill there. There aren’t a lot of people so it’s really quiet and you can just enjoy nature and the scenery. You often paint in public. How do you feel about people watching while you paint? I totally enjoy that. I develop relationships with a lot of people in the community because they are always interested and keep coming by to see my new artwork. I love explaining how I make my artwork and showing people or young artists how I do certain things. I’m always happy to share any information with them about my process or what I’m thinking while I’m creating the art. It’s just a real fun way to connect with people and when they get to see the final piece all the way through, they have more of a connection with the artwork. I have people come buy prints cause they saw me working on the original in my booth and they couldn’t wait for it to be done and see how it turned out. It’s amazing to get to share that connection with people versus them just seeing the finished piece in a gallery. They get to actually interact with me, the artist, and become part of the artwork and part of the inspiration as I’m making the piece. A lot of your work is sold at the weekly street fair and farmers market held Downtown. How would you describe Surf City Nights and its reflection of the community? If you’re visiting Huntington Beach for the first time and looking for something that’s family friendly, there’s no better place than Surf City Nights, which is held every Tuesday night. There’s awesome artwork, amazing food (you know, churros and other treats), the bounce house for the kids. All kinds of local businesses come together and you feel like you’re a part of the community when you’re walking down Main Street. There’s an eclectic mixture of people. Like the older couples walking over from their houses Downtown and locals that have their favorite vendors, where they have to go get their candied nuts every week, or bring their dogs to get their homemade dog treats. One of my favorite things is the live entertainment with younger local artists. Their friends and family always show up for support. It’s just a really fun time with a great community. Describe the artist culture in Huntington Beach and how Surf City Nights is helping local artists thrive. Surf City Nights is a great venue for us local artists where we can all come together and show our work. There are really no feelings of competition between us because each artist has their own unique audience and the artwork speaks to each person independently. We’re always rooting for each other to succeed and do well. We’re always happy when someone makes a big sale. It’s a real close-knit artist community at Surf City Nights. Have questions about Art in Huntington Beach? Ask Sam! You can find him on Instagram at @sambernal and Twitter at @sam_bernal_art! Shelby Barone runs OC Mom Media, the largest online publication for families in Orange County. She covers events, travel, and inspires people to visit her home, Huntington Beach, where she lives with her husband and three kids. Even though she’s busy running her website, she always stops to put her toes in the sand, letting Huntington Beach inspire her daily. What about Huntington Beach makes you love living here? I have three young children, and we love spending quality family time together in Huntington Beach, exploring outdoors and hiking. You can start your morning building a sand castle on the beach. Then spend your afternoon walking down Main Street, and end your day watching a beautiful sunset while dining on delicious cuisine in one of the amazing restaurants in HB. Did you have any ties to Huntington Beach before living here? Growing up in Orange County, Huntington Beach has always been one of my favorite places to spend time with my family. It is the place where my husband grew up, and the place where his family still lives today. Even with our busy schedule, we always try to find time to come play in the sand in Huntington Beach. Why would you recommend Surf City USA to families? 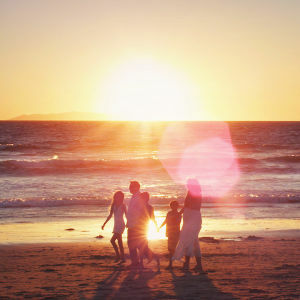 When looking for the perfect place to travel with your family, Huntington Beach has everything. From beaches to parks to restaurants to amazing weather, it is the perfect place to create unforgettable memories with your family. If there was one thing I was to miss about Huntington Beach, it would be the overall sense of community. Everyone feels like family when they’re in Huntington Beach. When would you say is the best time to visit Huntington Beach as a family? Whether you are coming to go dine in one of the fantastic restaurants, surf on the waves, or just walk down the pier, it is never bad time to come to Huntington Beach. Writing the OC Mom Blog, I love exploring Orange County with my children, and sharing wonderful places that other moms can bring their children. What do you think makes the perfect trip to Huntington Beach? If you were to bring your kids to Huntington, I would definitely walk along the sand with them, build a sand castle, do a little shopping down Main Street, and have dinner at one of the restaurants in Pacific City. We’ve created so many unforgettable moments here. And one of our favorite things to do together as a family is to stand at the pier and watch the surfers on the waves. Watching my kids laugh and smile, all the stresses of life went away in those moments. Have questions about Family Fun in Huntington Beach? Ask Shelby! You can find her on Instagram and Twitter at @glitterfulfelt or @ocmomblog! 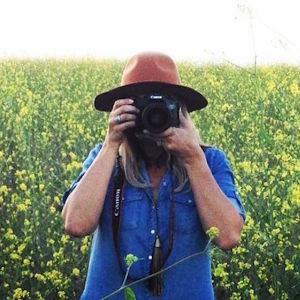 Candace Rock specializes in “photography for rad people” as a lifestyle, family and wedding photographer based in Huntington Beach. Her enthusiasm and love of the city are made clear in her photography style and locations. Candace’s work has been featured in the OC Register, Locale Magazine, and Modern Luxury, along with Good Morning America and many Huntington Beach local’s holiday cards. I live in Huntington Beach with my husband and two boys. We’re a family of surfers and long time Huntington Beach residents. Like most moms, coffee and red wine are staples in my life. On the weekends, you might find me hanging with my boys, running them to baseball practice, or shopping at vintage stores. And my passion is photography. What sort of photography do you shoot in Huntington Beach? I mostly do families, kids, and weddings. 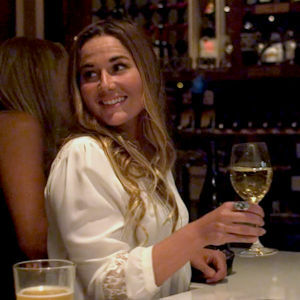 I’ve also worked with Sea Legs Wine Bar, OC Style Report, and many other clients. I love bright and vibrant images that are unique and filled with energy. For fun I also like to shoot nature. Are there certain parks or nature preserves that you enjoy photographing? The Bolsa Chica Wetlands is one of my favorite places to photograph. Especially in the morning, it’s just so quiet and peaceful. There’s something about standing on the bridge, watching the sun come up and seeing all of the beautiful birds flying around. It’s one of my favorite spots to de-stress and be one with nature. What are some of your other favorite spots to photograph in Huntington Beach? I have many favorite spots to photograph. There are so many places to shoot in Huntington Beach but my favorite is probably Huntington Central Park or down at the Pier. The lighting is amazing. I just love the way it shines through the Pier. It’s an almost magical place to photograph. There’s good people watching and lots of photo spots on the beach. Wide shot or close up, Huntington Beach always gives me that picture perfect frame. Do you have any tips on the best time for a photo shoot? My favorite times to photograph in Huntington Beach are sunrise and of course the golden hour, right before sunset. But I love a good sunrise session. There’s just something about that morning light coming up, everything’s fresh and new and so bright. As a photographer, light is your most important tool. There’s no lack of that in Huntington Beach. I’m constantly inspired by the sunlight here. Have you worked with visitors or families on vacation for any shoots? One of my favorite types of sessions is a travel session. A lot of people that are visiting Huntington Beach from out of state will book me for a family photo shoot while they’re here. They’ll meet me down at the beach near their hotel and we’ll just walk around. It’s always nice to see them enjoying Huntington Beach and taking fun family photos while they’re on vacation. Why did you choose to start your photography business in Huntington Beach? One of my favorite things to do is stop by the Sugar Shack, grab a cup of coffee, walk out to the beach and think about my next shoot. I keep coming back to Huntington Beach because it’s authentic and inspiring for someone in my line of work. The beautiful beaches, the weather, the parks, the awesome people, it’s an amazing place to raise kids. I love Huntington Beach. I was born here, I started my family here, and my business is here. My heart is in Huntington Beach and I want to live here forever. Have questions about photography in Huntington Beach? Ask Candace! You can find her on Instagram at @candacerockphoto and Twitter at @rockcandace ! 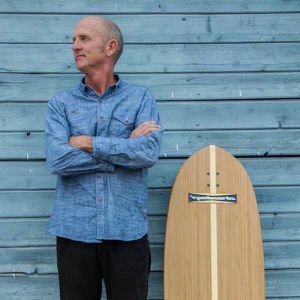 It took eight years for Pete Hamborg and his family to perfect the Hamboard, a skateboard that has captured the feeling of surfing on a wave, or as they say, “Hamboards is Surf City on Wheels.” The project has since taken off and Pete even appeared on the popular ABC reality show, Shark Tank, to pitch the oversized skateboard to investors. “You're selling the California dream, baby,” shark investor Robert Herjavec told the Huntington Beach locals. I grew up on the border of Illinois and Wisconsin on a family dairy farm and then moved out here to Southern California. I’m a fireman, happily married for over 30 years, and I’m the father of five boys who are all lifeguards here in the city of Huntington Beach. I’ve got a skateboard company called Hamboards that I’ve started with my sons and we market and sell those boards all over the world. A Hamboard is a big skateboard that rides like a surfboard. It’s really an outflow of our lifestyle and activities here in Huntington Beach. When did you determine that your idea for the Hamboard could be successful? So we were hearing about what was going on in Malibu a few years back, about how this big thing called stand up paddle surfing was being invented. People were really excited about it and it was even taking off in Hawaii. And at the same time, we’re riding our big skateboard around and realizing, this is really similar. So we ended up playing around with it, finding the right end and the right size, and soon enough we developed a land paddle. We realized this board is a way to enjoy all the fun of stand up paddle surfing but you’re able to do it on land, which is really more convenient. Describe the sensation of riding a Hamboard and how it differs from a normal skateboard. My favorite place to Hamboard is on the boardwalk in Huntington Beach. When I’m out for a cruise my sense of it is that I’m having more fun than anybody else. There’s such a unique flow and feel that its almost hard to describe. But it has this sense of speed and carve and it’s so much like being out on the water on a big wave that it’s almost addictive. It’s just such a blast. What have you noticed from the success of Hamboards? A fun aspect to the story of this family company that just grew out of a garage here in Huntington Beach, is how there is currently so much international attention for this little thing that we’ve developed. We get emails and contacts every day from Europe, Africa, Australia, New Zealand, Japan, Canada. It’s just amazing how people are noticing what we’re doing here and they want to find out how they can connect with it. We could have started Hamboards anywhere, but we didn’t. We started it in Huntington Beach and we are passionate about our connection with the city. How have Hamboards made a positive impact in the world? So our friend drove up here to Huntington Beach from San Diego and bought one of our biggest boards, the classic model. He took it down there with a land paddle and they finally got one of the soldiers out on the Hamboard and he started cruising down the hallway with an ear to ear grin. The whole ward just awoke and they started sticking their heads out of their doors. And before long, practically everyone was trying the board and cruising up and down the hallway. He was like, “you wouldn’t believe the impact it had. Like it was this healing moment for everybody.” People all over the world have ridden Hamboards and they see how it connects you with nature. But to realize that this little idea that grew out of a garage from this family that doesn’t know any better than to spend their time surfing, to find out that our little creation that we feel god dropped in our lap is now having an impact in a place as dark and desperate as that is just profound. Is Huntington Beach a source of inspiration for yourself and your company? The flow or essence of the organic lifestyle in Huntington Beach is a huge source of inspiration. The ocean, the sunsets, the palm trees, and the authentic lifestyle here allows for a special creative connection between what we do and how we do it. Every time I’m out on the boardwalk carving a turn with a beautiful sunset in the background, I realize how Huntington Beach keeps me inspired. These are key components when I’m designing the next Hamboard. How does Huntington Beach personify the California Dream? The Huntington Beach lifestyle is unique, even within Southern California. 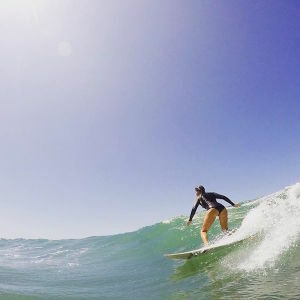 The constant opportunity to connect with the Pacific Ocean, whether you’re in the water on a surfboard or walking along the sand, is a dynamic that makes Huntington Beach one of the most fun places to live. The convenience of the wide, beautiful beaches and amazing weather is just simply amazing. So for me, it’s a constant source of entertainment and relaxation when you need to just get centered. What would you recommend to anyone visiting Huntington Beach? If you plan on visiting Huntington Beach, don’t miss the sunrise on the pier. Start out by grabbing a coffee or a hot chocolate at Java Point on the corner of Main and PCH. Cruise by the statue of Duke and take a walk on the pier. Watch the sunrise, see the dolphins, and say hi to the fishermen out on the Pier. Then go spend some time in the ocean. You can also enjoy the boardwalk. There are skateboards and bicycles you can rent and you’ll have one of the most amazing, sun-filled and fun-filled days. Have questions about Hamboards in Huntington Beach? Ask Pete! You can find him on Instagram at @hamboards and Twitter at @hamboards! Rocky McKinnon started McKinnon Shapes & Designs in the spring of 1997 after surfing for only a couple years. By 2002 he became a professional surfer and was quickly rated one of the top ten in the country. His custom surfboards also grew in popularity from Huntington Beach to Costa Rica and beyond. Rocky expanded his waterman abilities when he was introduced to stand up paddleboarding. He now offers surfing and stand up paddleboarding lessons in Huntington Beach from beginner levels to advanced wave riding technique. Tell us about your business in Huntington Beach. As a stand up paddleboard instructor I like to provide my professional surfing and stand up paddleboarding experience along with great equipment to ensure success. When you’re successful at stand up paddleboarding then you’re having fun. Whether I’m surfing, stand up paddleboarding or enjoying a beautiful day with my family, I can’t imagine being anywhere else. Why do you like to paddleboard in Huntington Beach? Huntington Beach is an amazing place to go paddleboarding whether you’re looking for an easy adventure in Huntington Harbour, paddling out in nature, or you’re looking for some fun waves to ride in the ocean. Huntington Beach has everything to offer for all levels. What are the health benefits of stand up paddleboarding? Stand up paddleboarding is such a unique and great workout because it provides you the opportunity to exercise your whole body in a low impact routine. You’re able to get a full isometric workout similar to pilates but you’re outdoors on the board in the water surrounded by nature. It’s definitely something that everybody can and should try. What do you love most about Huntington Beach? I’ve been fortunate in my professional career to travel around the world and what draws me back to Huntington Beach is the weather and the people. When I’m away from Huntington Beach, what I miss most is the accessibility to the waves and some of the great restaurants and food that Huntington has to offer. There are also great opportunities for business relationships and my friends and family are based here. Huntington Beach is an epicenter of anything and everything and that’s why I’m very lucky to call it home. How does Huntington Beach motivate you from both a personal and professional standpoint? Huntington Beach is an inspiring place because of its raw energy. From the people to the great weather to the surf, it is truly a place that energizes my soul. I have everything wrapped up here from my surfing career to professional stand up paddleboarding to my business making surfboards. When I’m getting ready for a competition on the south side of the Huntington Beach Pier, I can’t help but think back to all of the history that has taken place here. It really has made me a better person. Have questions about Huntington Harbour in Huntington Beach? Ask Rocky! You can find him on Instagram at @rockymckinnon! Dan McLemore is a Southern California local and dog lover. Working in corporate retail, Dan takes every chance he can to head to the beach with his wife Kelly and their corgi Mr. Pickles. In 2012, the McLemore’s hosted the first Corgi Beach Day gathering at Huntington Dog Beach. 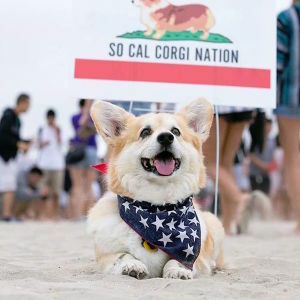 Now an official non-profit, So Cal Corgi Nation hosts over 500 corgis at their seasonal beach day events and even sell corgi swag on their website. I am a huge dog fan. My wife and I own Mr. Pickles, an eight year old Pembroke Welsh Corgi. He is part of the family. Do you think Huntington Beach is dog friendly? Huntington Beach is dog beach heaven. It’s a great destination if you are coming from out of town, because you can take your dog pretty much anywhere. Lots of hotels are pet-friendly, and most restaurants would love to have your dog on the patio. They have a great dog park in Central Park, but most of all the Dog Beach is the best place to take your dog. Fun surf, sand, and you can have a nice drink. It is a great day with your dog. So if you are coming from out of town, know that your dog is going to be well-cared for. From the hotels to the restaurants, and most of all – the beach. Huntington Beach is a dog lover’s paradise. What inspired you to create Corgi Beach Day? My dog Mr. Pickles was injured for about six months and missed a lot of the summer activities with all the other corgis. Corgis have a huge social media presence. So my wife and I wanted to hold an event where we can gather all his corgi friends and their owners, and what better place than Huntington Dog Beach! Why did you think Huntington Dog Beach was perfect to host this event? The reason we host Corgi Beach Day in Huntington Beach is because it’s got everything. The perfect surf, sand, sun, great views, amazing water – it’s the best. It’s the cleanest, safest dog beach in Southern California and has a great centralized location. Dogs love it, people love it, everybody loves it! It’s the perfect place for our event. How has the event changed since you started it? When we first met in the fall of 2012, there was about 20 corgis and 25 people. Everyone had a great time, lots of fun. Everyone wanted to do it again, so the next event we had about 75 people. Then three months later we had another event with about 150 corgis. Since then, the events keep doubling from two hundred to three hundred dogs. Now we are up to about 800 to 1,000 dogs at each event, and it continues to grow. Everybody loves corgis. We do Corgi Beach Day three times a year, and we love Huntington Dog Beach. It’s the best, cleanest, safest dog beach in Southern California and everybody loves it. We look forward to keep having it here. Have questions about Dog Beach in Huntington Beach? Ask Dan! You can find him on Instagram @socalcorgibeachday and Twitter at @corgibeachday!